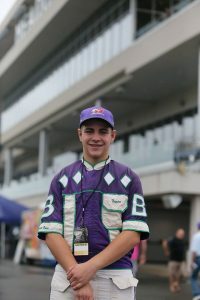 AJ Wright, the 14-year-old participant in the Harness Horse Youth Foundation’s Summer Youth League, won by open lengths in the exhibition race Saturday, Aug. 4 at The Meadowlands. The race kicked off the prestigious Hambletonian Day racing program. 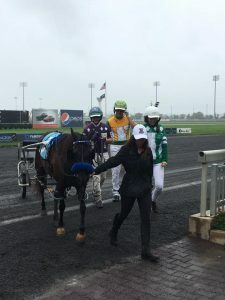 Guiding CD’s Miss M, AJ Wright rallied home to the win accompanied by driver Corey Callahan with the Trottingbred horse. AJ qualified for the event by winning a preliminary race at Historic Track in Goshen, NY earlier this summer. AJ borrowed a set of driving colors from Brandon Bates for his journey around the one-mile oval at The Meadowlands. Following the winner’s circle presentation, the native of Montpelier, Ind. was interviewed by Robert “Hollywood” Hayden, which went out over their television production program. The other two participants in the event included Alivia Smith, 12, of Olyphant, Pa., who qualified at the Downs at Mohegan Sun, and Genna Kerlin, 12, of Allentown, NJ, who qualified at Gateway in New Jersey. ISA Magazine’s official photographer Dean Gillette was on hand to capture all the exciting action at The Meadowlands during Hambletonian Day, including a start by Satin Dancer, owned by Byron Hooley, and Hannelore Hanover, the Indiana bred superstar trotter trained by Ron Burke.